The race is on to make the best four-door supercar and Porsche is so far in the lead. Prior to the Macan, Mercedes’ AMG wing sold as many cars as the entire Porsche brand, but hot new competition from the baby SUV has changed the game. And now that Porsche has pulled the wraps off of the Panamera Turbo E-Hybrid and the highly attractive Sport Turismo wagon, Mercedes is feeling the heat of competition. The Tri-Star can’t have the automaker encroaching on its dominant position, so it’s just teased the AMG GT we all knew was coming, the four-door AMG GT. Okay so technically this AMG is not a production model. Rather, it’s a concept being brought to the 2017 Geneva Motor Show to tease to the audience. Mercedes dropped news of the car in a Twitter post, saying, “Get a sneak peek of the Mercedes-AMG GT Concept. Catch an advance view of the four-door sports car at the Geneva Motor Show.” In the teaser image, we clearly see the rounded rear end of the AMG GT tied together by a single exhaust tip flanked by large diffusers. The plate reads “GT Concept” and while we can see the outlines of the four doors, the roof arch is what we’re most interested in. It’s worth noting that this is a teaser image of a concept and therefore shouldn't be expected to be the final result. However the large wheel arches and lack of door handles makes us wonder if Mercedes is going for a modern look with retractible door handles. While the Panamera didn’t start the four-door sports car genre, Mercedes seems to think it’s desirable enough to customers to garner a competing lookalike. Engine and hardware hasn’t been discussed yet but we can expect Mercedes to use its 4.0-liter twin-turbo V8 mated to a dual clutch transmission. 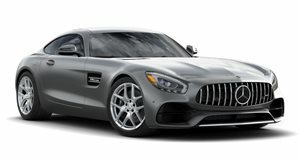 If wheelbases span too long, expect to see four-wheel steering to go alongside other AMG GT standard equipment like adjustable suspension, variable drive modes, and active aerodynamic equipment. As long as Mercedes endows it with plenty of horsepower and makes it an absolute joy to drive, which we’re sure it will, we can expect Porsche to be ever so slightly worried. Slightly.